This post is not for the benefit of entertainment. I just solved a small audio problem and I'm leaving a record to assist anyone who stumbles across this page from an internet search. The problem: My audio headset wouldn't play sound on my computer. I'm using Linux Mint 17. The details: My speaker is actually a headset. My computer detected it, and paired with it, but wouldn't play sound through it. I came across many bug reports where users couldn't get the device to show up in their sound settings list of output options. In my case, it appeared, but I couldn't select it. If I tried to test sound, it still came through the computer speakers. The solution: I installed PulseAudio volume control, which provides extra sound settings. I changed my Bluetooth headset configuration. I noticed that my bluetooth headset wasn't listed under output options. I clicked on the tab labeled "Configuration". My device is called "Popdrop". Originally, it's profile was set to "off". 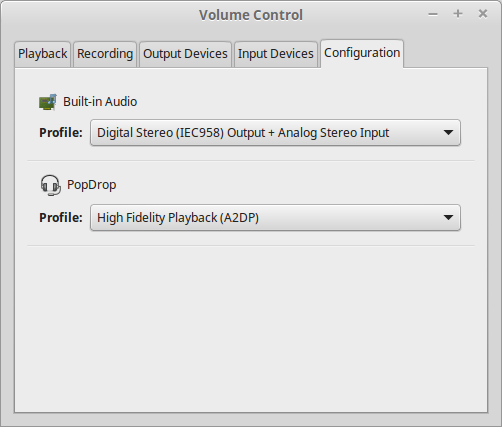 I changed it to "High Fidelity Playback (A2DP)". When I went to my sound settings and selected it, it now worked.